If you are just getting started with Drupal and are looking for some help on learning Drupal 7. You have come to the right place. 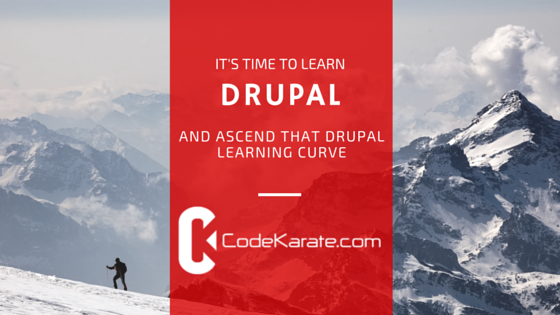 In this simple Drupal tutorial, I will highlight some resources for getting started, provide you some Drupal basics, and then if you are interested, you can sign up for Code Karate's 30 Day Drupal Email series (using the form at the bottom of this post). The email series breaks the entire Drupal 7 learning process into manageable chunks spread out over 30 days. In fact, the Drupal tutorial below is just a simplified version of what you will get in your inbox. First, you might be wondering... "what is Drupal and why should I use it?" Well, in it's simplest terms, Drupal is an open source content management system (CMS) that can be used to build all different types of websites from simple to very complex. Drupal allows you to create a website and manage all your content, media (images & video), users, and so much more. Drupal is much more than this, but hopefully that gets you pointed in the right direction. Drupal will help you build awesome and extremely flexible websites... that's the best simple definition I can think of. Now you are ready to learn about some available Drupal learning resources. The link below will take you to a link that discusses some of the various ways to learn Drupal. If you are ready to get started right now. Read the following two sections to learn how to get Drupal installed and how to start managing your content in Drupal. If you get stuck or need additional help, don't hesitate to contact me. There are many different ways to install Drupal. These different ways depend on how you want to develop your site and what type of computer you are using. The first question you need to ask yourself is if you want to develop your Drupal website locally (directly on your computer) or if you want to use a third-party service for developing your Drupal site. You will learn about each of these different options. The most common way to get started is to install your first Drupal 7 website directly on your computer. In order to do that, you will need to install some programs to get your own personal web server set up. The setup varies depending on what type of operating system you are using. In the following sections, you will find resources for getting Drupal installed locally for a variety of different operating system. You might wonder why Linux is the first on this list. Well.. perhaps I am a little biased. Either way, below you will find a link that will walk you through how to get a local development environment set up on an Ubuntu Linux operating system. Other flavors of Linux are similar, but may vary a little. If you are running Windows or Mac and want a more streamlined option, I would recommend using Acquia Dev Desktop. It provides a simple and seamless experience. Macs are also popular options for developing with Drupal. If you have ever attended a DrupalCon, Drupal Camp, or other Drupal-related event, you will undoubtedly have seen an abundance of Apple logos in every session. Installing Drupal on a Mac is pretty straightforward, just follow the videos below to get your own MAMP server set up. MAMP stands for Mac (the operating system), Apache (the web server), MySQL (the database), and PHP (the programming language). If you are using windows, you will want to install either WAMP (Windows, Apache, MySQL, PHP), or XAMPP. You will find links below for both options. Vagrant is a tool that allows you to build an easy to reproduce development environment. This means you will have a consistent development environment that you can rebuild, reconfigure, and essentially destroy as needed. It’s a tool that I along with many other seasoned Drupal developers use. If you are just getting started with Drupal, and you are not a well versed server administrator, you might want to come back to this later. If you do want to check it out, the link below can start pointing you in the right direction. There are other third party platforms you can use to develop your Drupal website. Some of these are built directly for developing Drupal websites, and others are built to support a variety of other platforms, but still allow you to develop a Drupal site. Here are some services that provide development environments specifically tuned for Drupal. Feel free to sign up to either of these for free to try them out. They have pretty straight forward documentation on how to create your first Drupal site. Here are some more general Drupal hosting services that CAN serve as a development environment. I would recommend using the other above options if possible to develop your Drupal site, and keep the options below for when you are ready to launch your site live. As you can see there are many options to install Drupal. Unfortunately there is no one right way. It all depends on what you are looking for. If you are in a bind and don’t know what to do, I would suggest trying Acquia Dev Desktop first, and going from there. Create your first few pieces of content on your Drupal site. These could be pages or articles but make sure you have at least one article. View your homepage to see a list of articles you have created. Notice that if you click on the title of the article you get to the full node page. From this page, you will see tabs at the top for viewing and editing the individual node. You have now learned how to add, edit and delete content from your site. Make sure to spend some time trying out the available configuration options when creating content to get a feel for what they all do. You now know how to install Drupal and how to manage content inside of Drupal, but you still have a lot to learn. These first few steps are only the beginning. If you want to continue learning more about Drupal, you can enter your email below to receive an email a day teaching you more about Drupal for the next 30 days. If you want to continue learning right now and don't want to wait 30 days, take a look at Code Karate's Learn Drupal in 30 days eBook. Good luck on your Drupal journey!